Growing gourmet mushrooms is an interesting gardening project that can provide you with numerous harvests containing more delicious gourmet mushrooms than you’ll be able to eat. Previous entries discussed growing mushroom kits and also looked at the alternative of growing mushrooms outdoors. Today I’ll provide more details for growing gourmet mushrooms in the backyard garden. 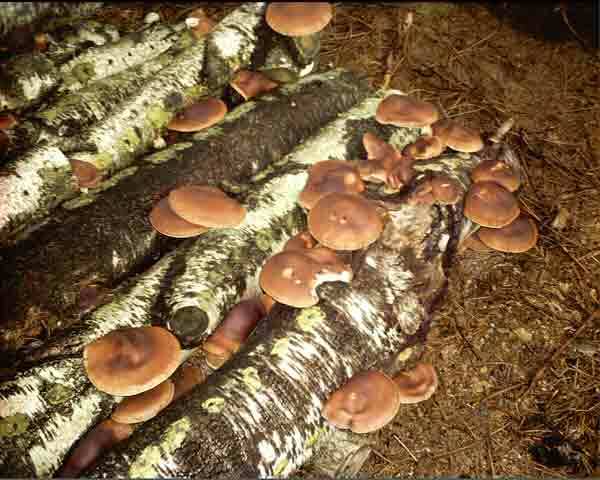 The first requirement is to locate a suitable source for the hardwood logs that will be used for growing the mushrooms. Certain types of wood such as oak and poplar work best but avoid soft woods such as pine and cedar, and make sure that you leave the bark intact. 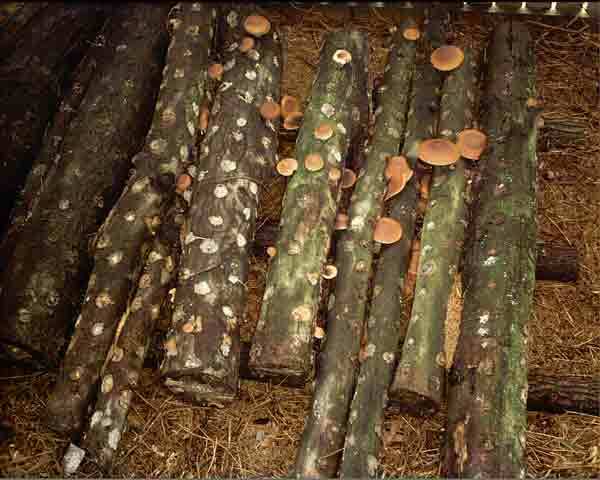 The logs must be freshly cut from live trees to avoid the risk of using logs that have already been colonized with strains of competing fungi spawn. So don’t waste your time trying to inoculate firewood or logs that have been laying around for any length of time. The best time to cut the trees is during late winter or spring before leaf growth begins. You can use any size and length, but three to four foot logs, less than fourteen inches in diameter will be easier to handle and work with. You’ll need to decide which types of gourmet mushrooms you want to grow and order the spawn that will be used to inoculate the logs. Popular choices for log culture include: Shiitake, Tree Oyster, Chicken of the Woods, Maitake, and Lion’s Mane. There are a number of companies that sell mushroom spawn on the Internet. I prefer to obtain spawn that has been grown on small wooden dowels that are easy to use when inoculating the logs. Pay close attention to the instructions included with the mushroom spawn regarding handling and inoculation. The spawn usually needs to be kept refrigerated prior to use and sometimes requires a period of rest to recover from the stress of being transported from the supplier. When you’re ready to inoculate the logs you’ll need a drill, hammer, beeswax, and a small paintbrush. Use the recommended size bit to drill holes about two inches deep and six to eight inches apart over the entire surface of the logs. Next, place a dowel containing the mushroom spawn into each of the holes and use the hammer to tap the plugs into the log until fully inserted. Depending on the diameter, a four foot log may require between forty to seventy-five spawn plugs to be inserted. The final step in the inoculation process is to seal the plugs with a light coating of melted beeswax. After the logs have been inoculated with the mushroom spawn they should be kept in a shady area where they will be exposed to rain, snow, and other weather elements. It may take up to a year or longer before you see the first mushrooms start to grow out of the logs. It can take that long for the spawn to fully permeate the structure of the wood before fruiting can occur. The gourmet mushrooms will be produced in flushes where the logs are quickly covered with the growing mushrooms. The flushes are most active during the spring and fall seasons and after periods of extended rainfall. Mushroom logs will continue producing over a number of years until the mushroom spawn has depleted the nutrients in the wood and the logs begin to break down. Do you know of any mushroom called “Verdi”? And it has a blue and green clumpy appearance on the outside of it. I’m trying to find some pictures to identify it if I can. Thank you. Hi Jennifer, I had never heard of a Verdi mushroom but I checked a couple of my mushroom field guides and one of them (“The Ultimate Mushroom Book”) listed a mushroom called Verdigris Agaric. It looks like that’s the one that you’re after. Do a Google search on it and you’ll find plenty of photos of this colorful mushroom. id love to start growing my own mushrooms how much do kits and growing mushrooms on logs start from ? I have a 1300 Sq. Ft., 6 ft. tall crawlspace that I am starting to use for vermiculture. It stays above freezing, but has very little light. I do have lights I can use however. Is there an advantage or disadvantage to growing mushrooms in a crawlspace? Do mushrooms need light? I have an abundance of Oak and Silver Maple, and can cut branches as needed. Hi Ron, that’s a good question and I don’t know the answer. Looked around and found differing opinions on the topic. I would guess that they do need some light but it can be filtered sunlight or from an indirect source. I would be curious to hear how well both your worms and mushrooms do in your crawl space, good luck. Can the hardwood log growing method be used indoors? Can you tell me how to pick them, how does one wait? And does one place them in a container when picked or cut off and placed in refrigerator? Ours are beginning to pop up and we hope to sell at Farmers Markets but I’m wondering about sanitation. So many unanswered questions. I’ve also read that wood from locust trees and black walnut trees must be avoided due to toxins in the wood that are absorbed by the mushrooms. These toxins aren’t lethal, but they will make you sick to your stomach. 1. You said at the beginning, “The best time to cut the trees is during late winter or spring before leaf growth begins.” The trees where I live are leafy all year through but I figure they probably grow new leaves in seasons, perhaps once or twice annually. I wonder, should I be looking for the time of the year just before leafing begins? 2. I’m really interested in indoor shroom growing but would like to use an approach that last longer than what the conventional indoor growing kits provide for. Do you think log growing can be done indoors? I watched the video and read your article. I am curious once you have innoculated the log and it is left outside, how do you prevent other mushrooms from spawning and growing on the log? I am concerned about wild muchrooms which may or may not be safe to eat. Hi Rick, once a particular strain of fungi takes hold it usually prevents other varieties from colonizing the same log. You should always be able to positively identify any mushroom before you eat it! I am thinking about growing my own mushrooms from logs. Do you know if Osage Orange logs would work, & if they are dead in the tree (Getting read to prune some large limbs out of the tree in my yard.) Will the Osage Orange logs produce mushrooms? Would you bother with the dead ones even if they are not in any state of decomposition. I have a place in my backyard that does not receive direct sunlight. It is under a large tree that prevents me from having a regular garden. It is where I keep my compost pile, and occasionally I get plants that grow from my cold compost pile with the indirect reflective ambient light. Is this a good place to grow the mushrooms, or should I build some sort of canopy? How much light is too much? I like your website. I found it by watching your Youtube video. I am bookmarking this site so I can read the rest of your posts. Looks like you have been doing this for a while. Thank you for sharing your information with everybody! Hi Derek, I’m not sure how suitable Osage Orange is for making mushroom logs and have never heard them mentioned as a good choice but you could always test it out on a small scale if you have lots of that particular wood on hand. Don’t use dead prunings for mushrooms… it’s best to use live cut wood partly to ensure that other mushroom spores haven’t already colonized the wood. The spot that you have picked out sounds like a good location to me.